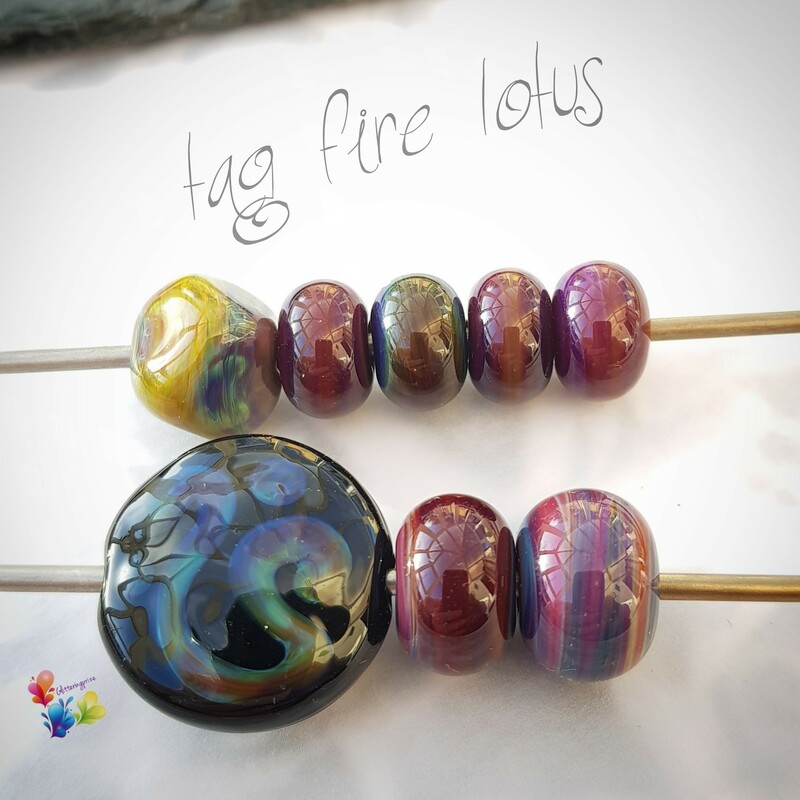 TAG FireLotus 104coe was the "go to" colour 5 years ago for most lampworkers but as TAG concentrated more on Borosilicate colours their 104coe range dwindled until they became out of stock everywhere........now its back. Fire Lotus 104coe was relaunched by TAG in December 2017 after a long period of being out of production. 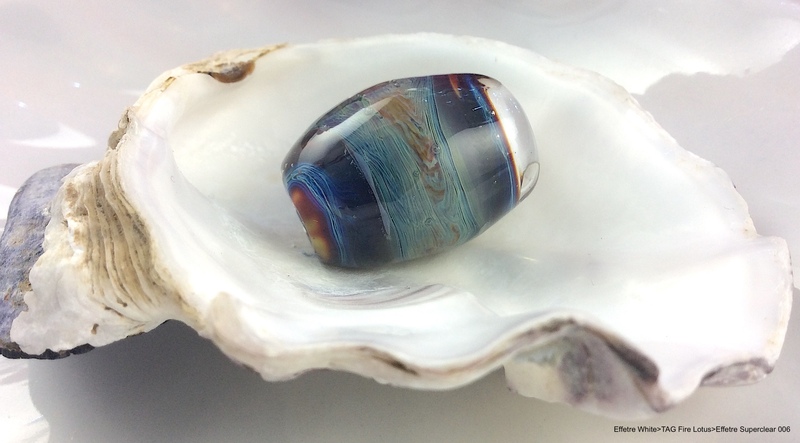 Traditionally this was the lampworkers favourite so we were interested to see what our testers could do with it. Testing TAG Fire Lotus glass. 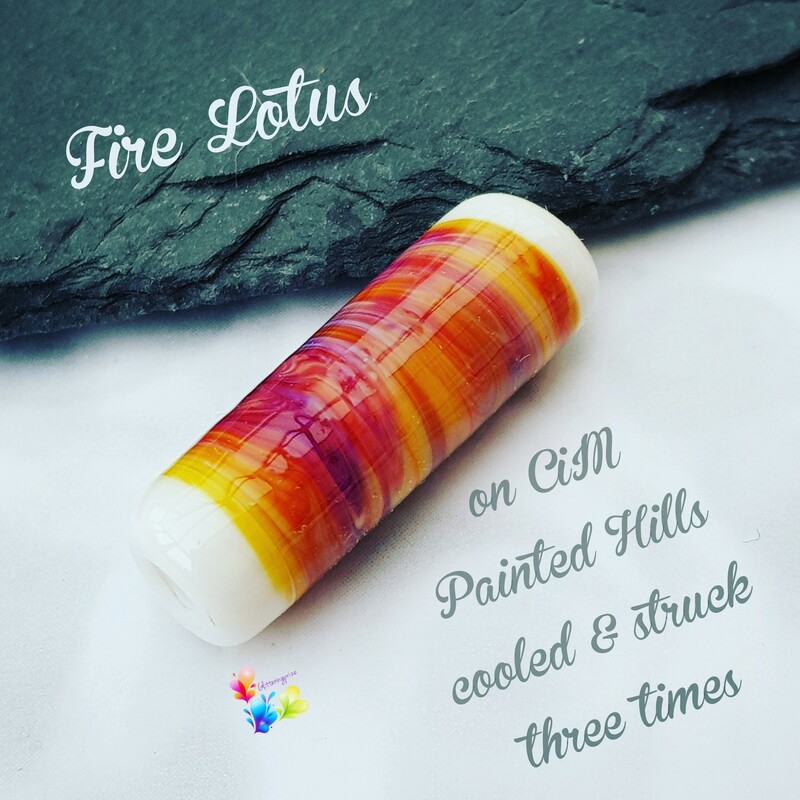 Fire Lotus is a striking glass in coe 104. It hasn't been available for a few years, but it's back in production & it's a version of their Dalai Lotus with the addition of a kiln striking red. As with most striking glass, it likes to be worked hot. 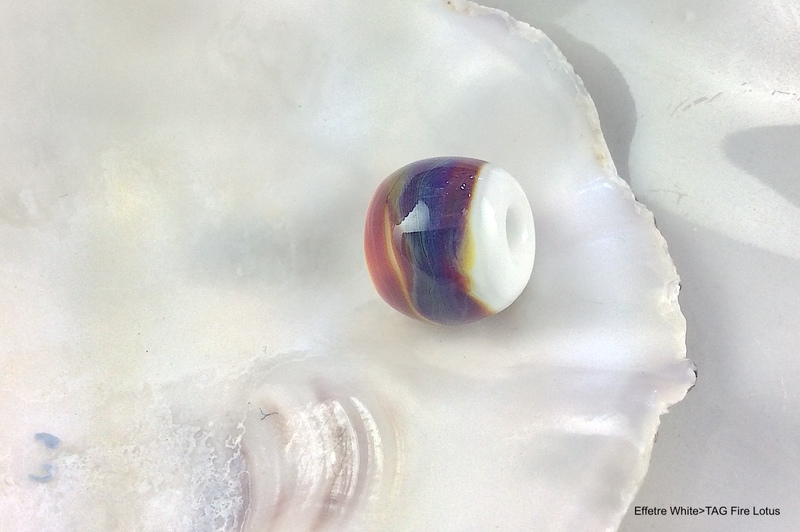 The top row beads were made getting the glass white hot, and allowing to cool for as long as possible before striking gently in the top of the flame. As you can see it produces a range of colours. The nugget had multiple heating and cooling cycles. 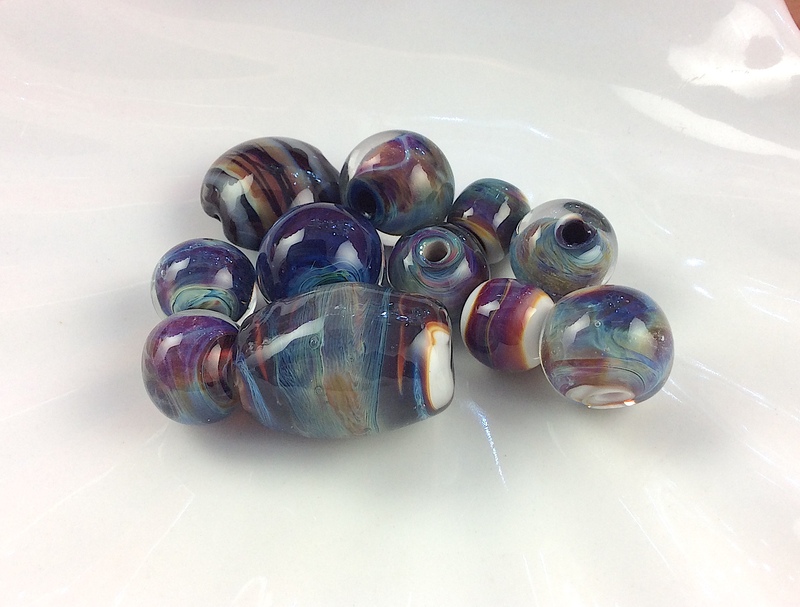 With the round beads I found that the colours went in the kiln were muted versions of what came out. The annealing process seemed to intensify them. Then I wanted to see what might happen if I got the glass hot, but not screaming hot. So for the bottom row the glass was heated to a bright orange glow. The lentil was made on CiM Tuxedo with a Fire Lotus stringer and was cooled with pressing, and I allowed to cool further and then gently heated the surface in sections. 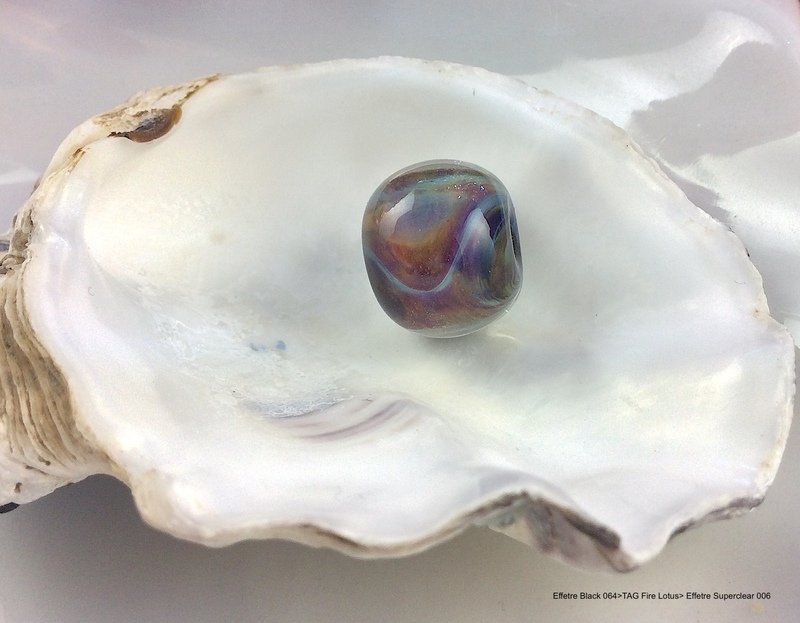 The round beads were made over a core of Effetre white, cooled and struck gently in the further reaches of the flame. Again you can see the colours develop and the finished result was a more vibrant version than it was going into the kiln. I work on a Bethlehem Alpha and a 10 litre oxycon. Bear in mind when you try this, every set up is a little different, and my flame mix will not always be the same every day so results may well vary, but that's part of the charm of reactive glass. Try it and play, see what results you can get! hot before applying to the mandrel. (white hot) and it becomes difficult to control on the mandrel. 3. Remove from the flame and spin behind the flame to shape and cool slightly. marver until the bead looks clear. 5. Then wait some more and the bead will have a lime green tinge to it that darkens slightly. Keep cooling (overall around 30 secs) until you think it may crack if you cool anymore! soft orange glow (this should only take a few secs). and 7, 3 more times. 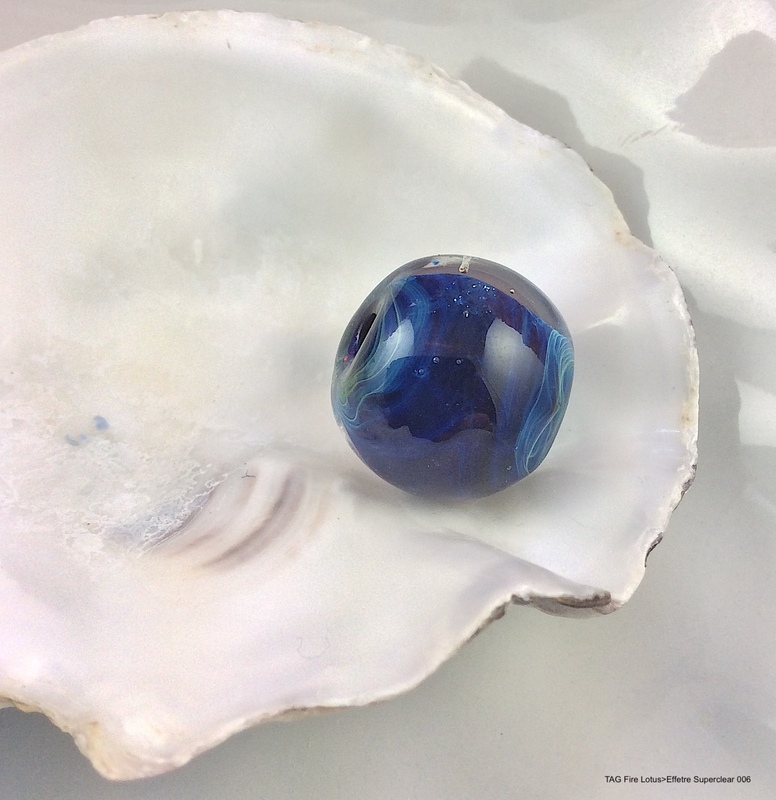 * The bead that looks navy with streaky blue ends was only struck once, then encased. Effetre Black 064>TAG Fire Lotus> Effetre Superclear 006. 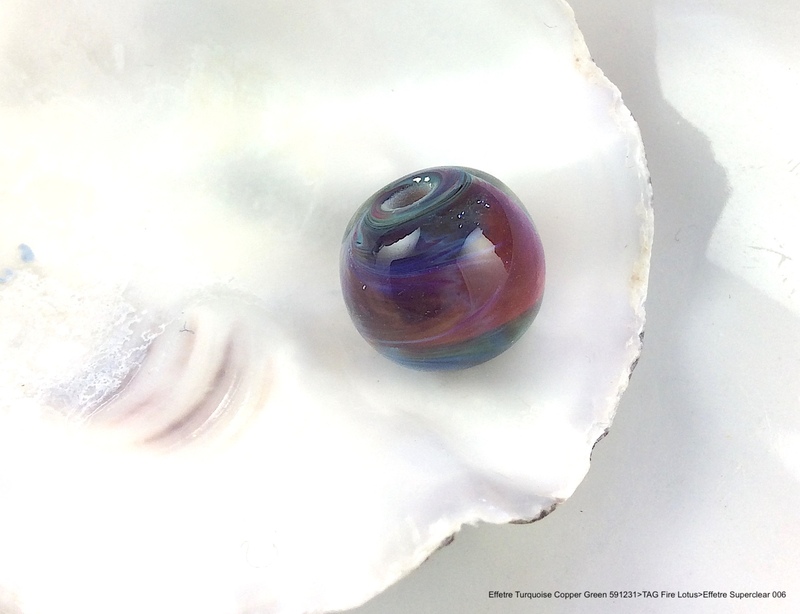 Lotus ensuring it is super hot before applying to the spacer bead. it becomes difficult to control on the mandrel. 9. Encase in Effetre Superclear 006 ensuring only to melt in the encasement, not the whole bead. 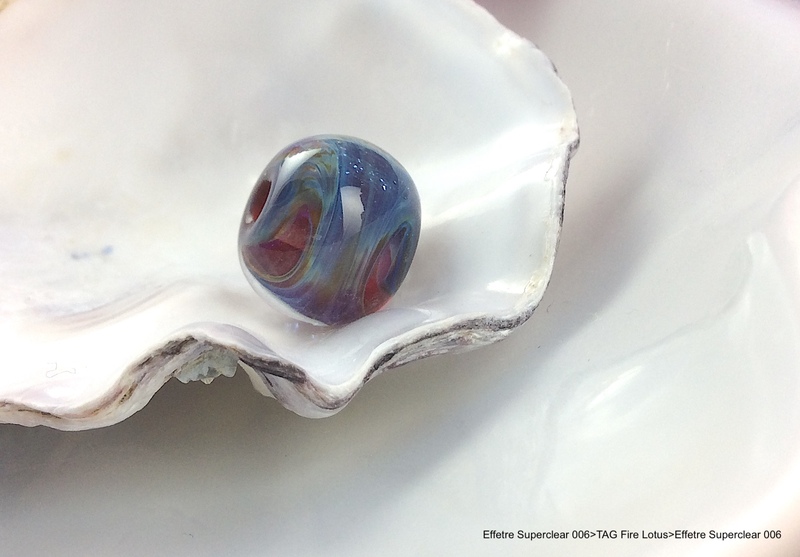 Effetre Turquoise Copper Green 591231 >TAG Fire Lotus> Effetre Superclear 006.
small gather of the Fire Lotus ensuring it is super hot before applying to the spacer bead. Effetre White >TAG Fire Lotus> Effetre Superclear 006. Effetre Superclear 006 Core >TAG Fire Lotus> Effetre Superclear 006.
of the Fire Lotus ensuring it is super hot before applying to the spacer bead. ensuring it is super hot before applying to the spacer bead.